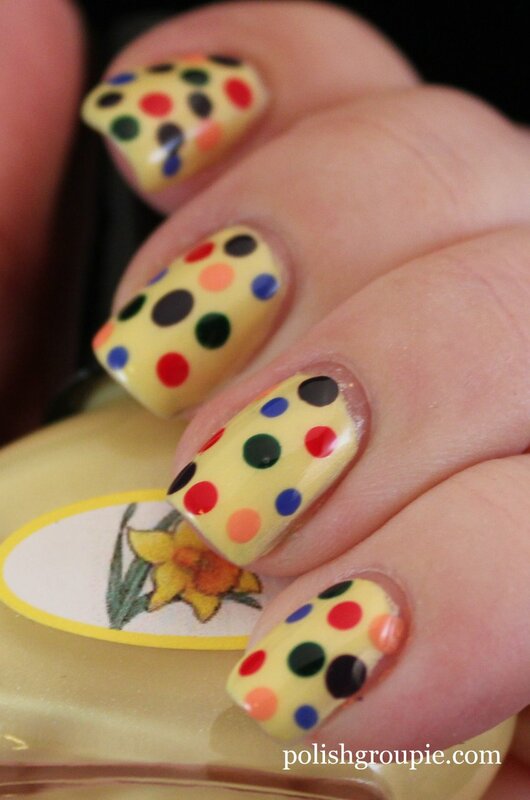 I think technically Day 11 of the 30 Day Challenge is supposed to be polka dots, but I just did gradient dots and realized it a little too late. 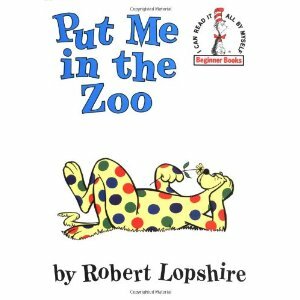 I actually like it quite a bit, so I hope you do too even though it’s not quite what was called for. 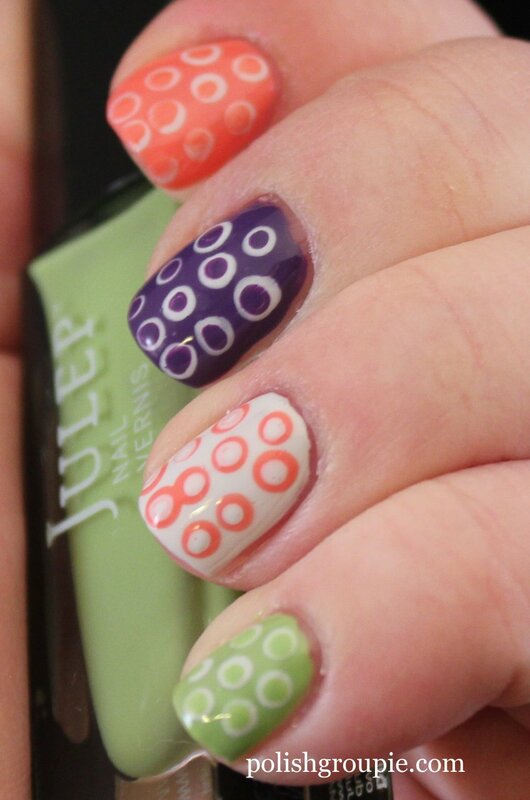 I’m simultaneously doing 30 Days of Untrieds, so I fit a few new polishes in as well. 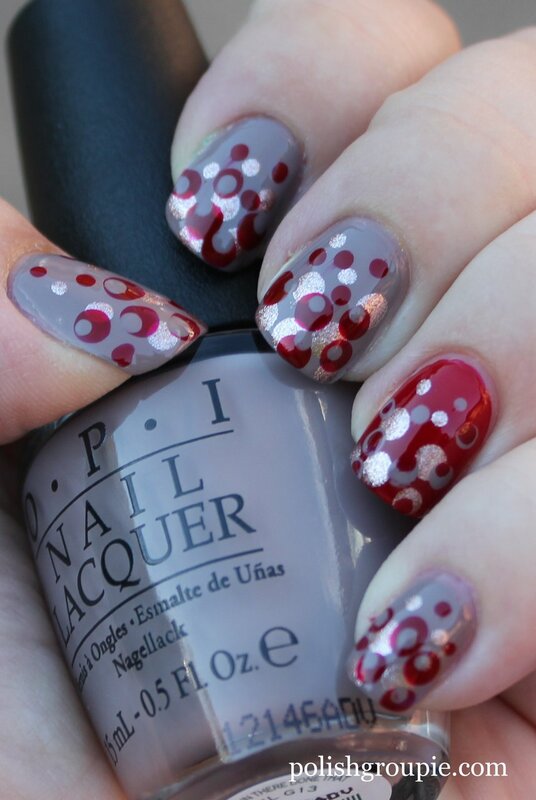 I started with two coats of OPI Berlin There Done That, a taupe creme, on everything but my ring finger, which has two coats of Sinful Colors Ruby Ruby, a bright red jelly-leaning polish. 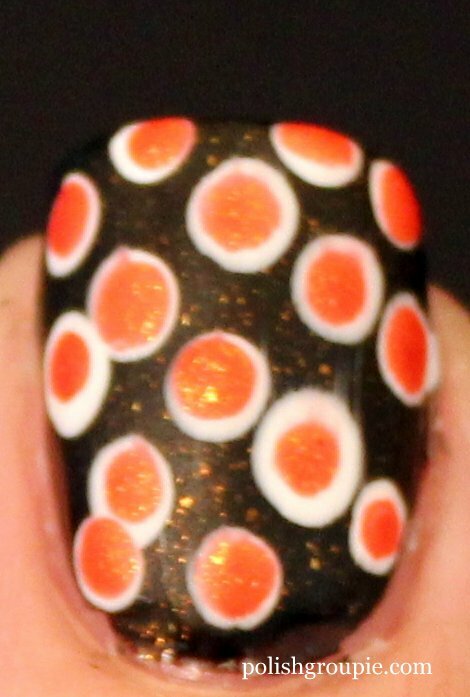 For the dots, I used the head of a straight pin to do the large dots, starting with Orly Rage, a rose gold foil. 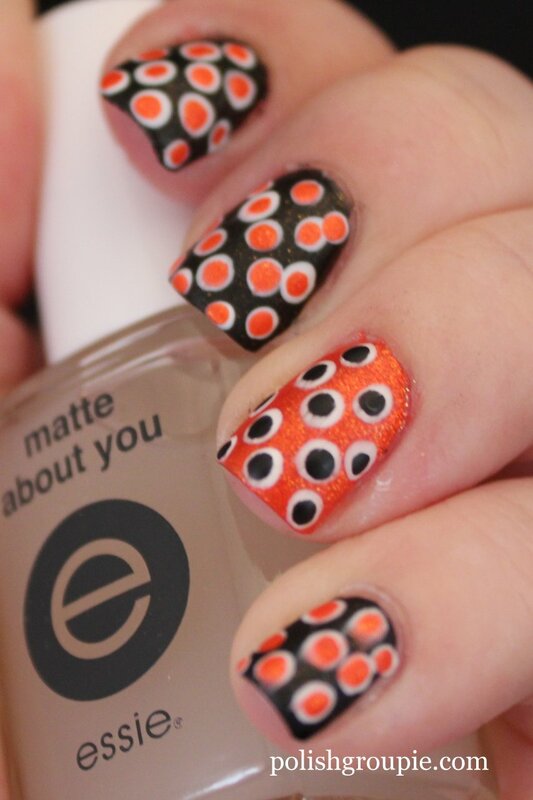 I layered over that with large dots in the opposite color of the base nail, and then added some smaller dots with a small dotting tool down the nail to create a gradient effect. 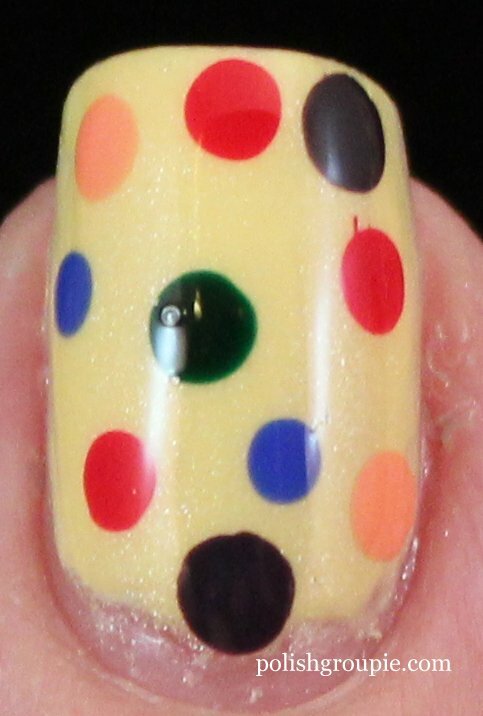 Then I want back and added some base-color dots inside the large “opposite dots,” i.e. 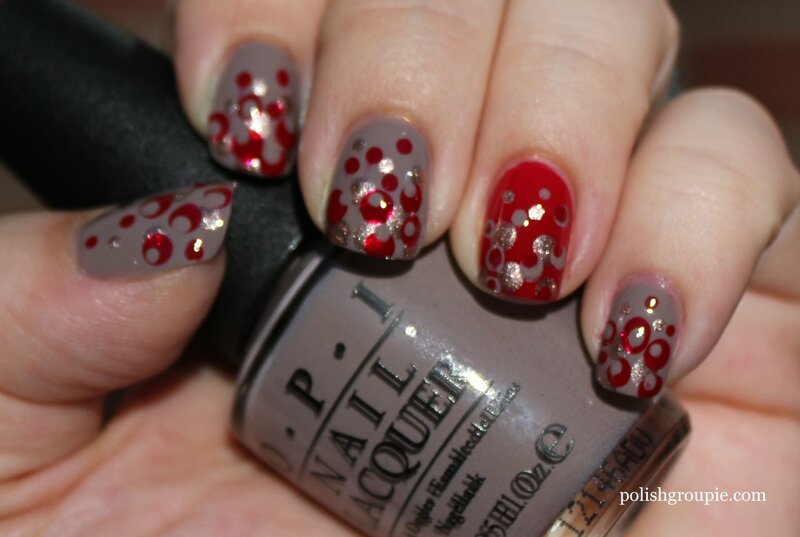 added red dots to taupe dots, taupe dots to red dots. 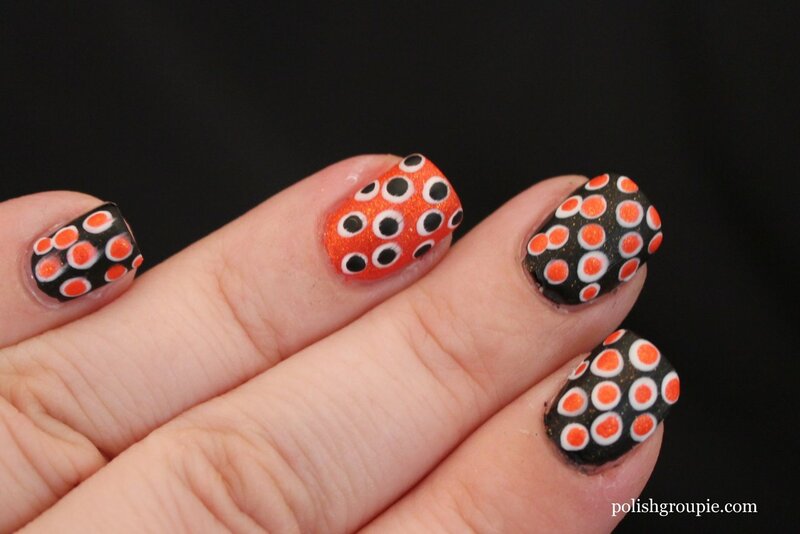 I overlapped the dots a bit and also made sure some hung over the tips. 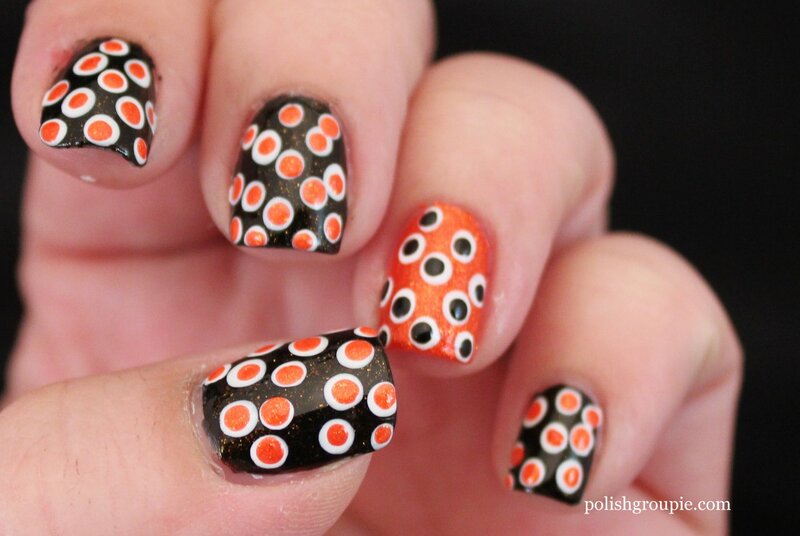 My inspiration came from this gradient dot manicure from Chalkboard Nails. 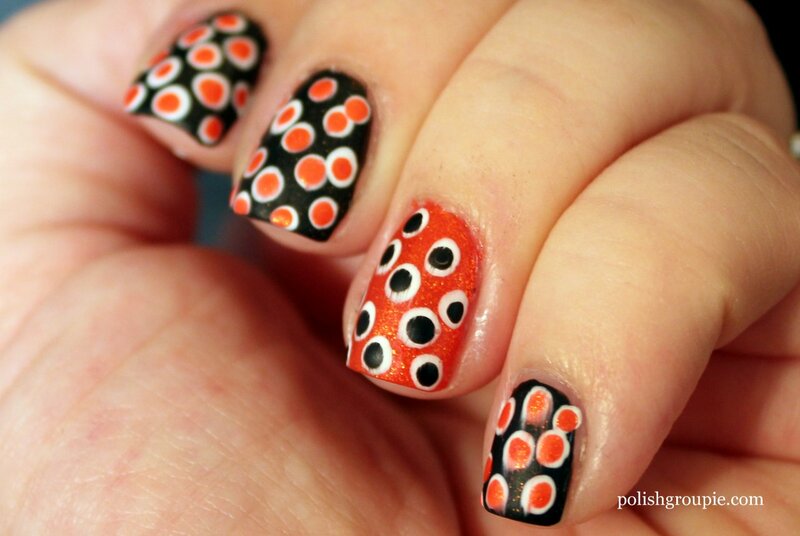 I finished everything off with a coat of Poshe fast-dry top coat. I was a little sad to have to take this one off to move onto the next challenge! 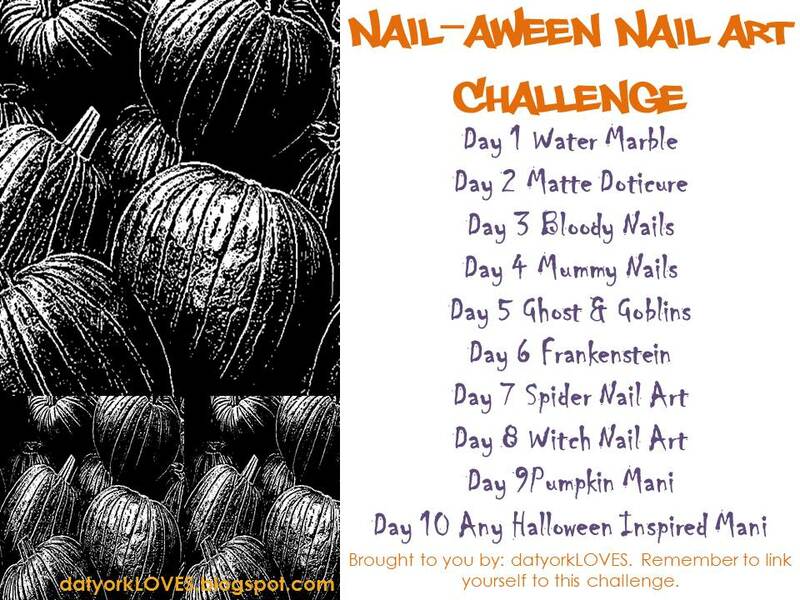 I almost didn’t make it through Day 7 of the 30 Day Challenge without having to buy another bottle of nail polish (*the horror!*). 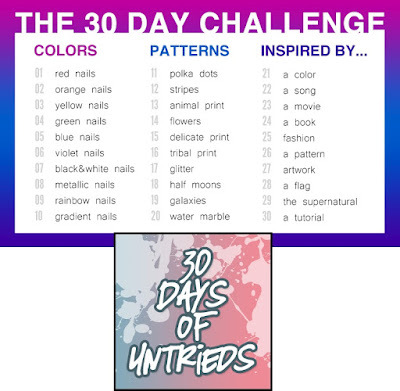 It wasn’t the theme of black & white that was the problem; it’s the fact that I’m simultaneously doing 30 Days of Untrieds. 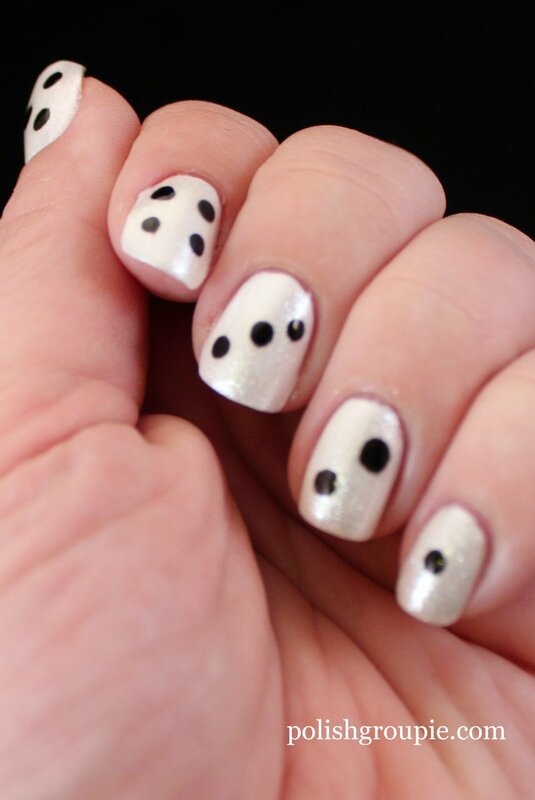 I only have one bottle of black polish, which I’ve already used, so if I couldn’t come up with a suitable untried white, I would have no choice but to go buy something new. Luckily (unluckily? ), I was saved by A-England, which also happens to be the brand I featured yesterday for the violet day of the 30-day challenge. Loving this brand, so easy to apply, and beautiful! 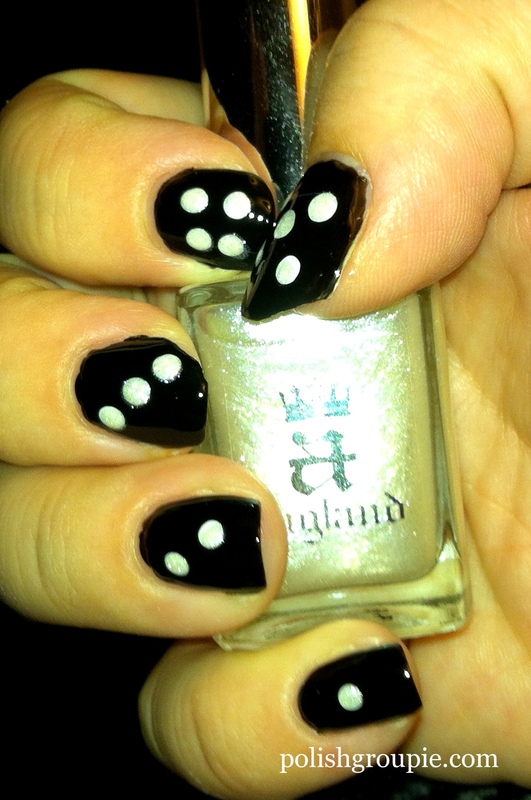 This manicure includes: two coats of NYC French White Tip under two coats of A-England Morgan Le Fay (untried), with Orly Liquid Vinyl. 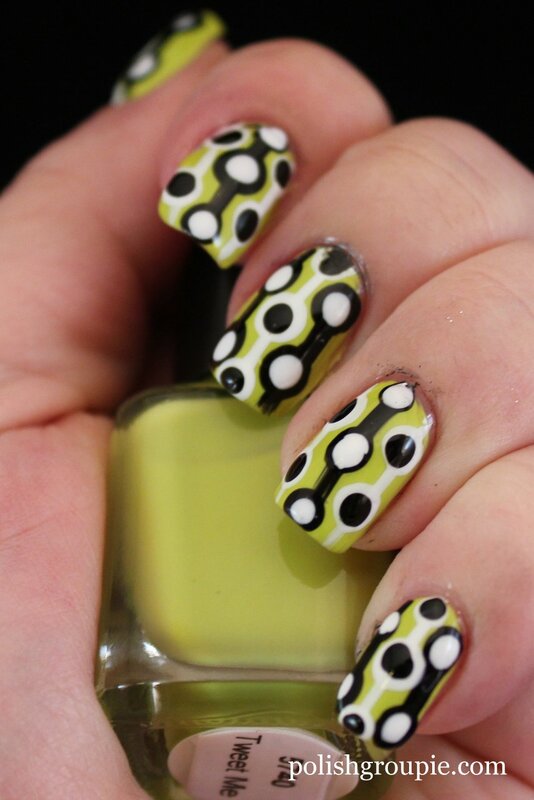 I finished it with one coat of Poshe fast-dry top coat. I liked the shimmer that A-England Morgan Le Fay brought to the table. There’s more going on here than if I had used a basic white creme. 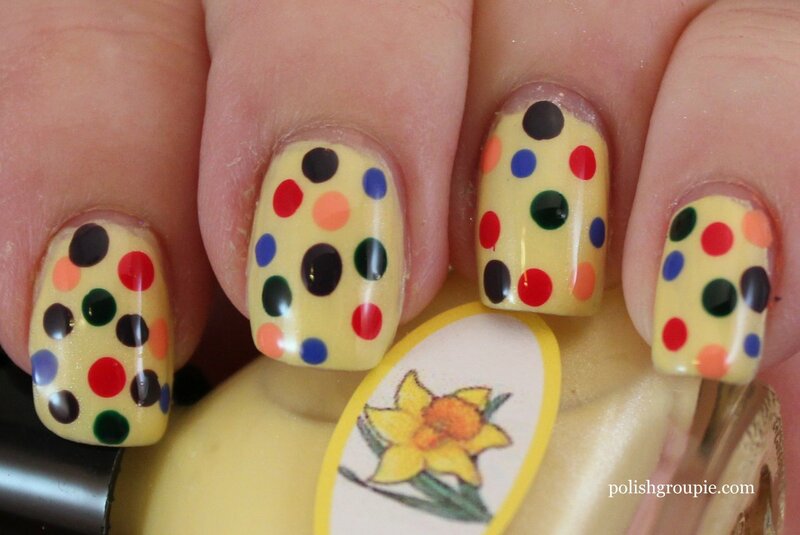 The dice theme is pretty easy, which is good for me since I am not that comfortable with dotting tools yet. 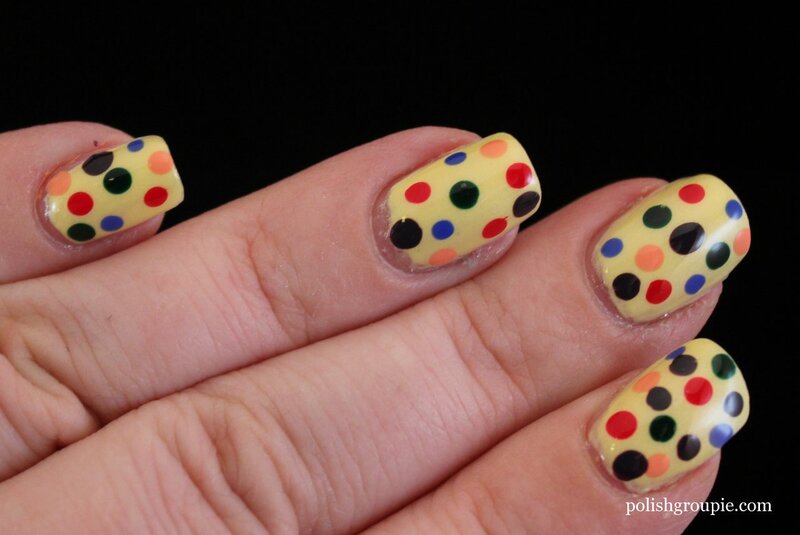 I actually used the head of a pin as my dotting tool, and it worked pretty well for me. I didn’t get them totally uniform in size, but I’m working on it. 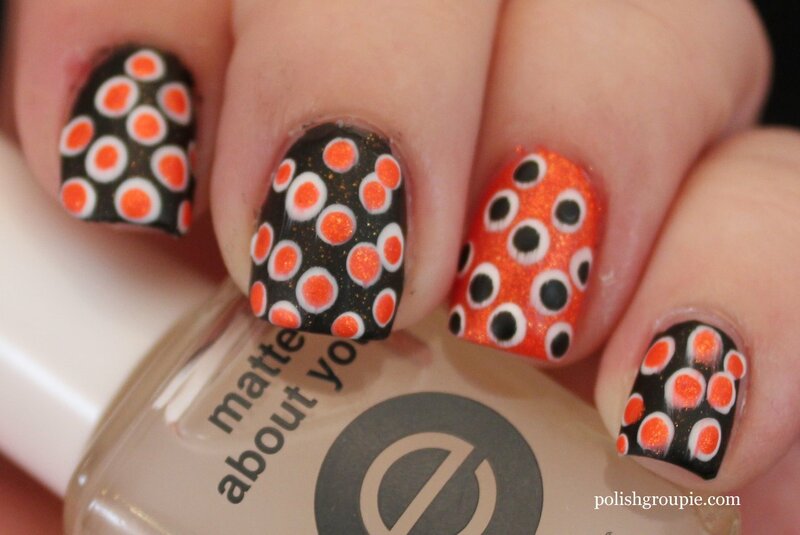 The Daily Varnish has a great post on DIY dotting tools, if you want to check it out. Here’s a quick iPhone photo of what I did with my left hand … too complicated to take a one-handed photo with my other camera! 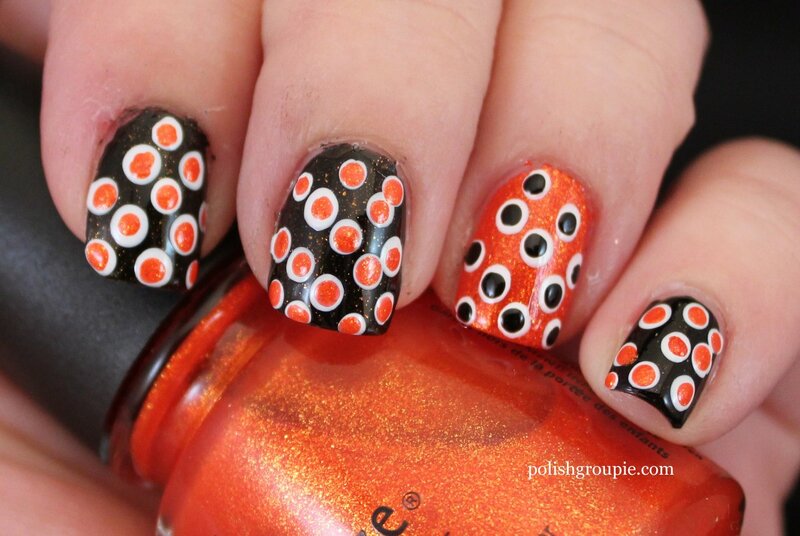 Have you used any household items as dotting tools? Let me know what you’ve had success with.